Do you use HSBC Credit Card? How do you get your Credit Card Statement? The Bank must be providing the card statement every month or as specified by you while applying for the Credit Card. What if you require the credit card statement for any reason after? You may have lost the precious months or any other month's statement! You can view and download HSBC Credit Card Statement online following simple steps. You need not visit the branch to obtain the statement and waste your valuable time. Visit the Internet Banking site of HSBC Bank and enter the login credentials, i.e. User ID and Password to log in. Click on 'Statements/ Advice' option available on the left navigation bar. Click on 'View and Download Account E-Statement' button. 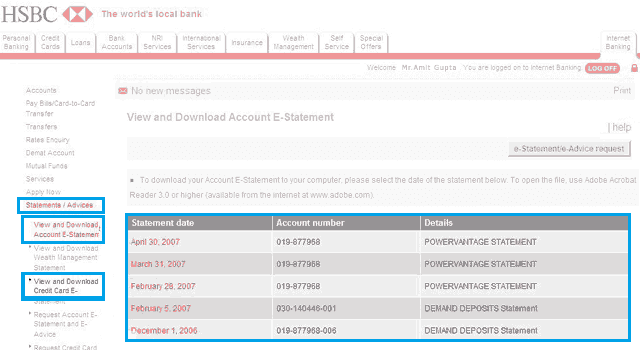 Select 'View and Download Credit Card E-Statement' option. The screen will display the list of E-Statements generated till the date. You need to select the particular month to get the card Statement for the month. You can get the credit card statement for the last 6 months. After selecting the month, the E-Statement will be automatically downloaded in PDF format. Important Note: The HSBC Credit Card statement will be download in PDF format, so make sure you have Acrobat Reader 3.0 or higher version to view the file. Only registered card holders for Internet Banking can access the service. You need not visit the branch and request for the credit card Statement. You can obtain the E-Statement any time and from anywhere accessing online. It is simple and hassle-free. If you don't have internet banking account, then first register for internet banking online. After successful registration, you can view and download statement without any hassle. If you have any problem and suggestions, leave a comment in below box. my credit card statement not sent by email so far. I used the card on 11th July 2018.